The market price at which something is bought or sold is everything in investing. A stock’s price is a single number that expresses a collective view of investors’ knowledge and expectations about a company. We can argue all day about where a stock should trade today, or what it could be worth in the future (if a whole bunch of assumptions pan out), nevertheless it’s all theoretical until you hit the BUY or SELL button at a particular price. Wise investors understand that earnings matter – and that they are only one piece of the puzzle. Companies can have phenomenal earnings growth and yet the stock declines. Likewise, a company can have miserable, even negative earnings, and the stock price still rises. The swing factor is valuation. Start with the basics: a share of stock represents ownership in a company. You own the stock, you own a share of the company’s earnings. As a company’s profits grow, so grows the value of your slice of the corporate pie. If earnings go up, logic says so should the share price in proportion. Example: Home Depot. Nearly a year ago, on 12/29/2017, earnings per share for the forthcoming 12 months were expected to be $8.35. 11 months later, on 11/28/2018, earnings for the forthcoming 12 months are expected to be $9.80 – a growth rate of 17%. Sounds good to me! So HD shares are up by that amount, right? Nope. 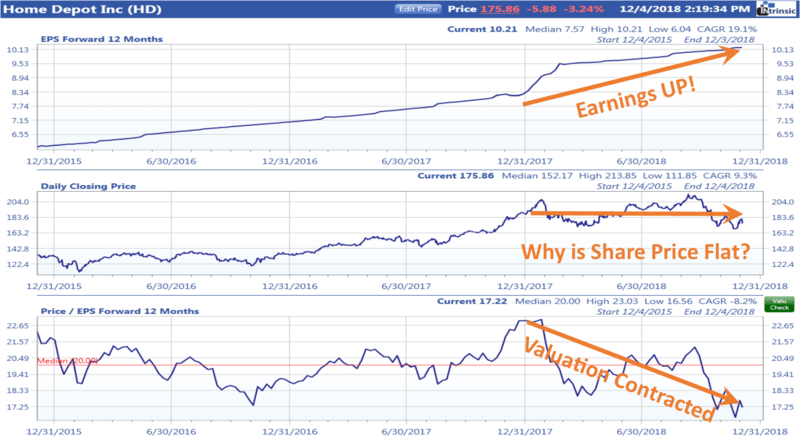 HD shares were $189.53 on 12/29/2017 and $177.43 on 11/28/2018, a decline of 6%. What gives?? 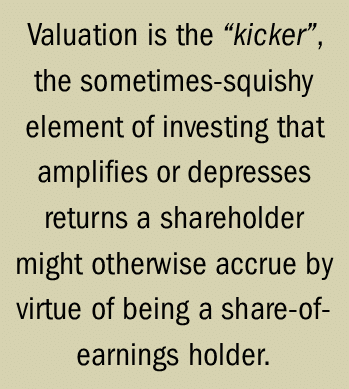 Answer: valuation. 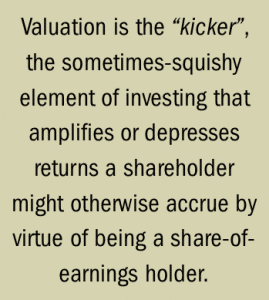 Valuation is the “kicker,” the sometimes-squishy element of investing that amplifies or depresses returns a shareholder might otherwise accrue by virtue of being a share-of-earnings holder. Investors valued HD’s earnings at a (price-to-forward-earnings) multiple of 23 in late 2017. Today HD’s forward-P/E is 18, as evidenced by the chart below. Analysts’ forward earnings estimate for HD shares may have risen by 17% in 2018 – but investors dismissed this healthy corporate performance by knocking 20% off of the valuation they were once willing to pay for earnings expected to come in over the next 12 months. Why? 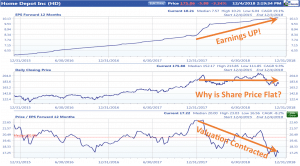 When investors decide a company’s earnings are worth less, they place a lower valuation on a company’s earnings by lowering the price at which they are willing to own a share of these earnings. Higher profits are great in the eyes of stock investors…unless or until the growth rate for those profits is lower than last year’s, or if next year’s growth rate begins to look measly in comparison to this year’s. Such is the case for HD – 2019 could see another tremendous year of record sales and profits for HD. Sounds great… except the consensus expectation for the rate of earnings growth next year (2019) is all of 5% ($10.29/share, compared to $9.80) – a rather puny number for investors accustomed to mid-teens growth rates over the past few years. The moral of the story is this: stock investors like acceleration. They do not like deceleration. In the minds of most investors, accelerating revenue growth rates, or earnings growth rates – or better yet, both! – warrant higher valuations. Decelerating rates of sales growth or profit growth warrant lower valuations. The best investments, those which provide the juiciest returns for investors, are those which put both levers to work – accelerating earnings and rising valuations.